Despite its name, the Texas Railroad Commission does not actually deal with railroads. Rather, the three-member Railroad Commission is the agency that regulates the oil and gas industry in Texas. Notably, the Commission’s Chairwoman Christi Craddick, is the only woman currently holding a statewide executive office. Originally elected to the Commission in 2012 for a six-year term, she was unanimously selected Commission Chair by her fellow commissioners in 2014. 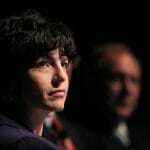 Craddick hails from a high-profile Texas political family – her father, State Representative Tom Craddick is the former Speaker of the Texas House of Representatives and the longest serving Republican legislator in Austin. Craddick’s primary opponent, former Texas Real Estate Commissioner and oil and gas businessman Weston Martinez, attacked Craddick from the right and claimed that the agency under her leadership lacked transparency. Craddick, however, cruised to a dramatic victory, besting Martinez 75.83% to 24.17%. This large margin should come as no surprise since Craddick outspent Martinez by more than 2 million dollars. In November, Craddick will face Denton’s historic preservation officer Roman McAllen. McAllen secured the Democrat party’s nomination by netting 58.5% of the total vote over his primary opponent, Chris Spellmon’s 41.49%. McAllen’s claim to fame is that the south Texas city of McAllen is named after his great-great grandfather, Alfred Barreda “Nene” McAllen. Between now and November, McAllen, who boasts that his lack of background in oil and gas would be an asset to the Commission, will continue to try to frame the race around the environmental issues. McAllen believes the oil and gas completion technique known as “fracking” causes earthquakes, and he would like to make water conservation the number one issue. A persistent and prolific fundraiser, Craddick has amassed 810 times more campaign cash than her opponent. According to the most recent reports, Craddick’s cash-on-hand totals $1,498,530.68 compared to McAllen’s $1,850.28. As a percentage, this gives her a greater advantage in her race than any other statewide elected official. It will be interesting to watch whether Craddick (or any other statewide office holder for that matter) will share any of their campaign wealth with down-ballot Republicans who actually face a serious challenger in November. Texas law requires political contributors to list their occupations and employers, and Craddick’s financial reports are replete with owners of oil and gas businesses from across the state. In general, Craddick has been viewed favorably from within the energy industry. Plus, it never hurts to be in the likely winner’s good graces. Who’s not in the game. The heavy-hitting Democrat donors — both PACs and individuals — seem to be sitting this one out. No one is under the impression that a Democrat candidate can win statewide in 2018, so major Democrat donors are opting to fund candidates in state legislative swing districts instead. McAllen’s largest contribution is $1,000 from a Gilmer, Texas, construction manager, Richard Henson. In the primary, Roman McAllen beat his opponent Chris Spellmon by spending only one cent per vote. Such a low cost-per-vote is literally unheard of. In a primary, candidates obviously can’t count on straight ticket voting, so maybe the name “McAllen” simply resonated with voters. Whether efficiency or luck, McAllen’s primary victory was certainly impressive. Our Race to Raise series takes a deeper look at the most high-profile races of the election cycle, focusing specifically on money raised by those seeking to serve in public office. Stay tuned for the next installment.